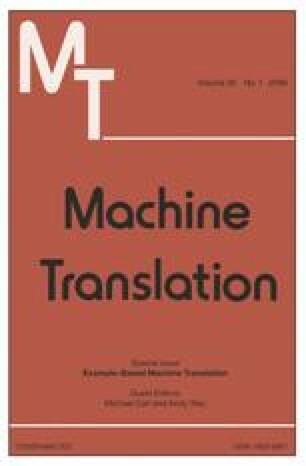 This paper describes an example-based machine translation (EBMT) method based on tree–string correspondence (TSC) and statistical generation. In this method, the translation example is represented as a TSC, which is a triple consisting of a parse tree in the source language, a string in the target language, and the correspondence between the leaf node of the source-language tree and the substring of the target-language string. For an input sentence to be translated, it is first parsed into a tree. Then the TSC forest which best matches the input tree is searched for. Finally the translation is generated using a statistical generation model to combine the target-language strings of the TSCs. The generation model consists of three features: the semantic similarity between the tree in the TSC and the input tree, the translation probability of translating the source word into the target word, and the language-model probability for the target-language string. Based on the above method, we build an English-to-Chinese MT system. Experimental results indicate that the performance of our system is comparable with phrase-based statistical MT systems.